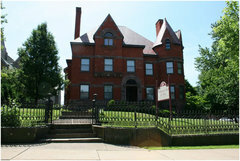 Erie Women's Club, 259 West 6th St. Suggested donation $5, If you are not currently a JazzErie member, you can purchase a membership at half-price: $12.50 for Individual. $20 for Family, $15 for Seniors, $15 for Senior Family, $7.50 for Students. Party includes free refreshments (wine, beer, soft drinks) and hors d'oeuvres. Parking on the street or adjoining church lot. Great music, great companionship, great refreshments, a satisfying evening. Ed. note: This is the first installment of a two-part story on the career of the extraordinary musician,teacher/pianist Basil Ronzitti. Basil will be the honoree at this year's JazzErie Members Party. After the interview, Basil called me, concerned he'd spoken immodestly. "I was a brash young man." I assured him I'd smooth any rough edges, but couldn't find any. If anything, he downplayed his talents. Basil began his music career as a piano accordion student of his father, Mose. "He worked almost every night," Basil recalled,"at the Eagle Club, and around, playing accordion, which was very popular at that time, or upright bass." "If you were a student of Mose, you had to practice." Basil practiced 4 to 6 hours a day and achieved a level sufficient to study with the renowned Russell Messina of Buffalo, N.Y. Mr Messina was known world wide. Study consisted of applied theory, jazz and classical for one and a half years. He used piano to tease out chords and melodies in arrangements he heard on the radio or records, but never performed on piano -- accordion was his instrument. "But I heard nothing for the next two weeks. One day one of the guys said 'C'mon, Ronzitti,' and took me to an Officers' Club across the street to sit in with the band there. I guess it went OK. He told me unofficially I was in but I didn't want to get my hopes up. Then the official posting came. I was in. "They assigned me to be an assessment person, evaluating skills of the players who came into camp. There were some terrific players, from all of the best bands in the country. I was the only pianist in the camp at that time who could comp (a jazz style of piano accompaniment, emphasizing space and accents). Most of the pianists ere classically oriented and played only basic, straight rhythms. So I got to play with the jazz band. They were excellent musicians, and I learned a lot..
"On one of my trips home from Missouri, I had a three hour layover in Indianapolis. A couple of blocks from the bus station, I stopped in a little club where from the street I could hear music. Guitar, bass & drums. The young guitar player was doing things I had never heard before --, swing, speed, articulation. Just unbelievable. I stayed as long as I could, then ran to catch my bus. "When I got back I was looking at some album covers and there he was. 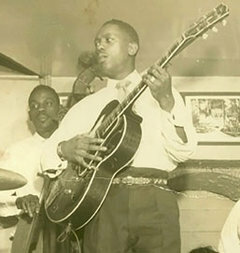 Wes Montgomery!". After Basic Trainingand Secondary Training came assignment to a permanent post. " The best players would be assigned to bands in the big cities. Army musicians had to have a broad range of skills: choir, concert and marching bands, pop and jazz bands. 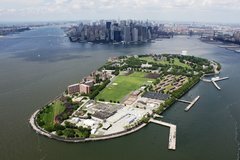 When I got my assignment it said 'Governor's Island.' I'd never heard of it and it sounded like some very remote outpost. Then a friend saw it and said, 'Man, I'd kill for that assignment.' Turned out it was an island just offshore from Manhatten, by the Statue of Liberty, and all the generals were stationed there. I was in the First Army Band. It was a great situation -- the best musicians up and down the East Coast and I wasn't about to lose it. After two days I told him I was ready. He called out marches randomly and I played them. He wanted to know how I'd learned them so quickly. I explained I knew many of the melodies, and the others I'd studied and learned. "That's one of the things you get with me." Ed. : I remember your saying that somewhere along the line, you came to understand that your greatest contribution was in teaching. How did that come about? "When I was 15, my father, who was very busy giving lessons, asked me to help him with an (accordion) student. She was probably about 10, and she was struggling. I observed how she was placing her hands on the instrument, and her arm movement. After awhile I made some suggestions about these things, and she said it helped. That was maybe my first experience that I could teach. "I listened and analyzed a lot of classical performers and watched and listened to how they did it. When I returned from the service in 1963, I joined my father's business, teaching accordion and piano -- all classical. But I was teaching mostly kids, and I also worked in some pop and eventually some jazz. After awhile, I began to suggest students getting together to form little bands. Some of these were successful, and my name got out there as a teacher for pop. "Our classical students often entered local, regional and national competitions, and they often won -- over five hundred awards between 1965 and 1969.. One regional competition stopped giving awards because our students were winning them all. I was teaching a broader range of instruments by then: piano, accordion, guitar. Between 1967 and 1972 I realized the need for a broader range of repertory, adding pop and jazz, and theory -- but only played theory, not just academic. I expanded to include college students, and Edinboro University made me an Adjunct Professor and referred a number of students to me." MORE TO COME! 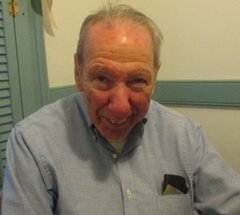 BASIL RONZITTI -- PART 2 will appear online and in a Special eLetter in early January. STAY TUNED!